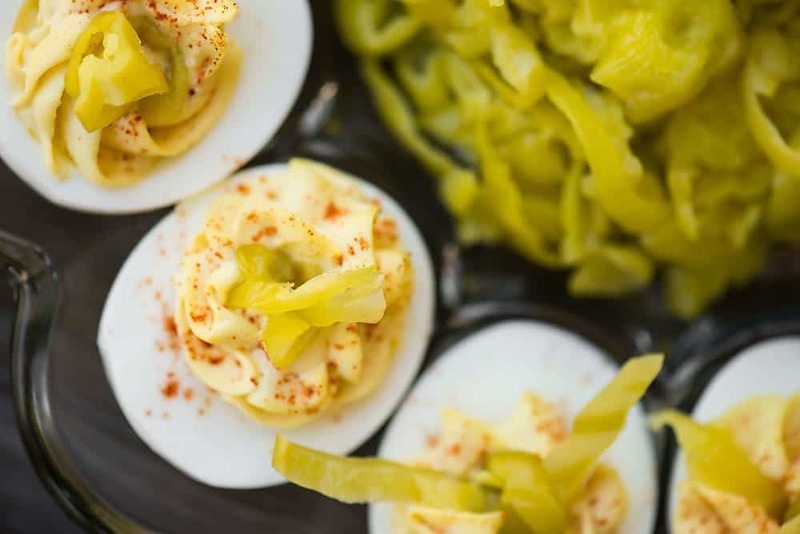 Flavorful Peperoncini Deviled Eggs are the perfect bite sized appetizer that everyone will love. The flavor and texture will have them flying off the tray! I haven’t always been a fan of deviled eggs. It wasn’t until I was an adult when I realized why. 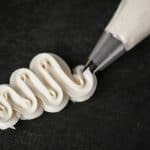 What I realized is that not only do I require high quality ingredients that taste good, but I’m a bit of a texture freak. For some reason, there are certain foods that I can’t stand eating on their own. 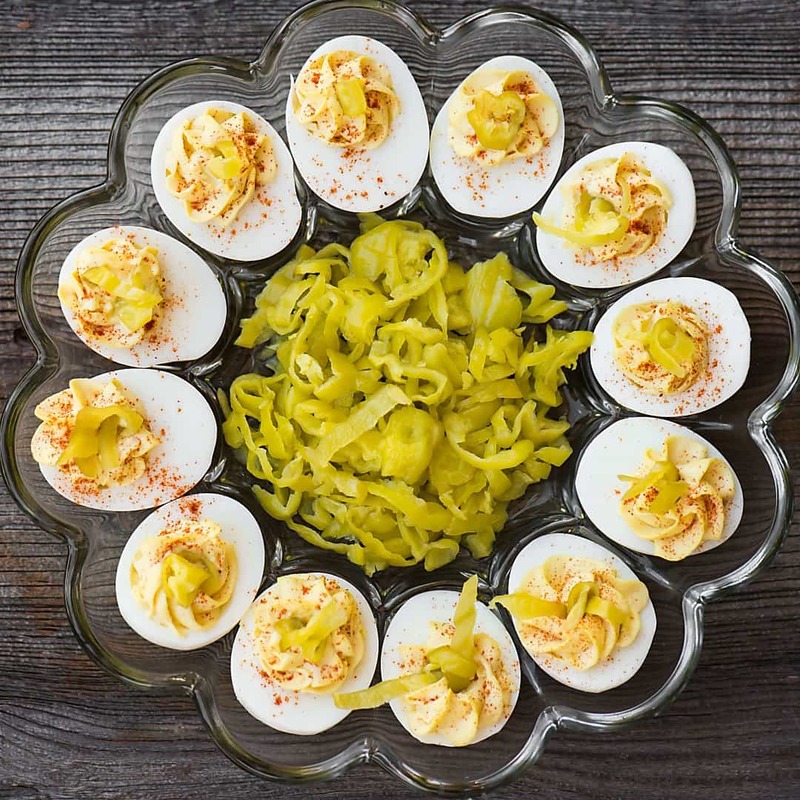 The two that stand out the most are yogurt and hard boiled or deviled eggs. See, I love yogurt but I make it the same every time – plain yogurt with fresh fruit, maple syrup, and nuts. Not only do I need to enhance the taste, but my mouth needs to feel different textures. A bite of plain yogurt will surely set off my gag reflex! Same kind of thing with deviled eggs. I have no idea if they’re too soft on their own, but I’ve come to realize that I’ll turn down a plain deviled egg. But put some crispy bacon or a spicy peperoncini on top? I’ll take more than my fair share! 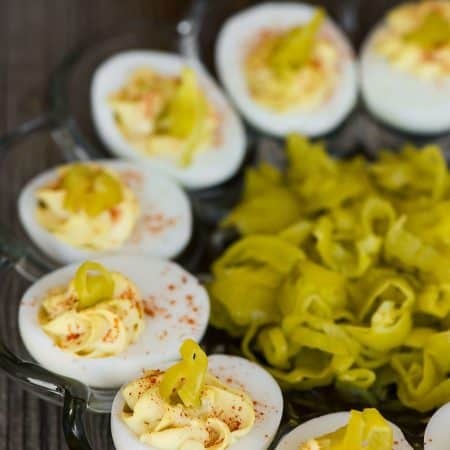 Not only did I incorporate the brine into the egg yolk mixture and top each one with a slice or two of peperoncini, but I served the deviled eggs with the remaining peperoncini so that everyone could take as much as they want – which turned out to be all of it. This recipe will help you get to the bottom of the jar. 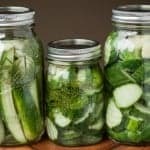 Go look at all the jars that have been sitting on your refrigerator door. 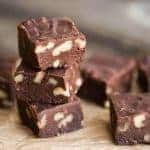 Don’t you wish you had found a recipe where you could have used the entire contents of the jar rather than let them sit there for months, forgotten? My recipe calls for 6 eggs which would yield 12 deviled eggs (easy math), but I highly recommend making a lot more than you think you’ll need. 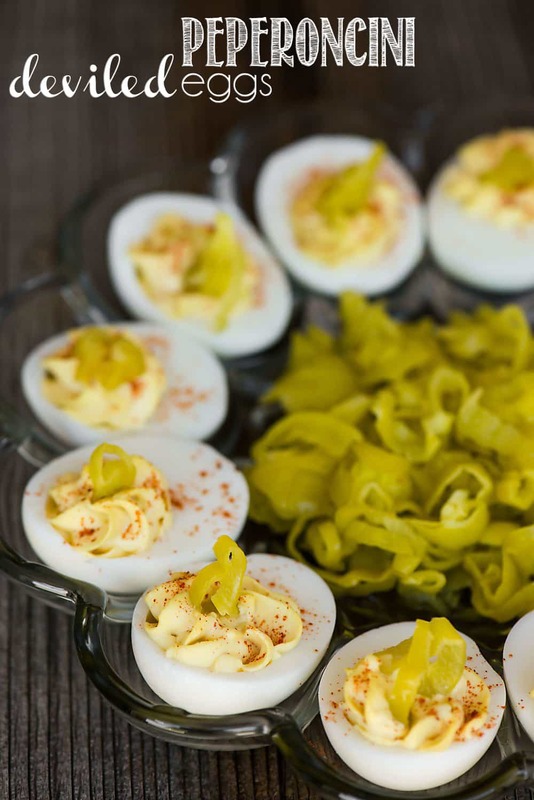 Deviled eggs are always a desired appetizer and these deviled eggs will be devoured quickly. That is a promise! Bottom line – there’s nothing earth shattering about this recipe. 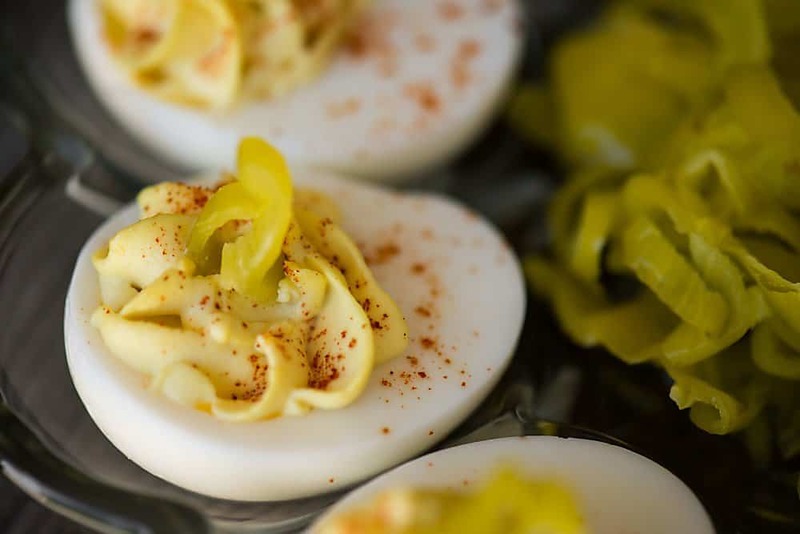 It’s nearly a standard deviled egg recipe. The only difference is that the addition of peperoncini took it from basic to crave worthy. YUM! Place eggs in large pot and cover with enough water so that there is about an inch of water above them. Bring to boil over high heat. Allow to boil for only a minute, then cover, remove from heat, and allow to sit in hot water for 15 minutes. Carefully drain and immediately transfer to ice bath. Once eggs have fully cooled, peel and rinse them. Slice each egg in half lengthwise and carefully remove yolk by adding it to a small bowl. For a prettier presentation, you may rinse the egg white halves, taking care to not tear them, and then pat dry. Smash the egg yolks together and combine with mayonnaise, Mezzetta Peperoncini liquid, yellow mustard, and salt until smooth. Spoon or pipe yolk filling into each cooked egg white half. Top with desired amount of Mezzetta Peperoncini slices, and dust with a bit of smoked paprika. Serve along side remaining Mezzetta Peperoncinis. 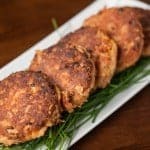 You may consider doubling, tripling, or quadrupling this recipe as they will be devoured!